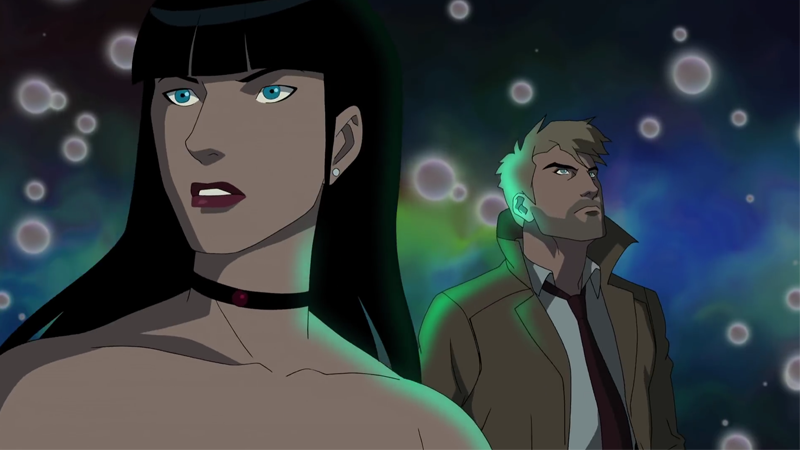 Warner Bros. Animation’s latest DC movie might be under fire at the moment, but the next movie in line from the studio’s roster is finally going to give fans something they’ve wanted for a while, whether live-action or otherwise: the Justice League Dark in action. And now, we have a first look. The footage has hit the web in the wake of The Killing Joke’s home release, including a trailer and a brief behind-the-scenes look at the film. Check it out below. The featurette confirms, unsurprisingly, that the line-up of the main team in the film will feature John Constantine (who will indeed be voiced by Matt Ryan, who played Constantine in the short lived NBC live-action show), Black Orchid, Etrigan, Zatanna, Deadman, and Swamp Thing. The usual Justice League will also appear—Batman, Wonder Woman, Superman, and Green Lantern all make brief appearances in the footage above—as supporting characters, when the supernatural heroes are called in to handle mysteriously magical things going bump in the dark. Batman in particular will play a large role as the audience’s introduction to the world of DC’s magical characters, and a skeptical foil to the team. Justice League Dark will release later this year.